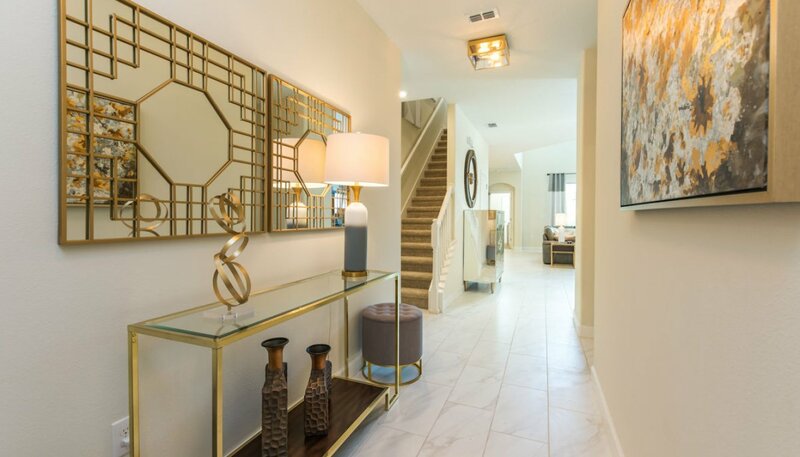 As you enter the villa you are greeted with a fabulous tiled hallway leading off to queen bedroom 5 to the right. 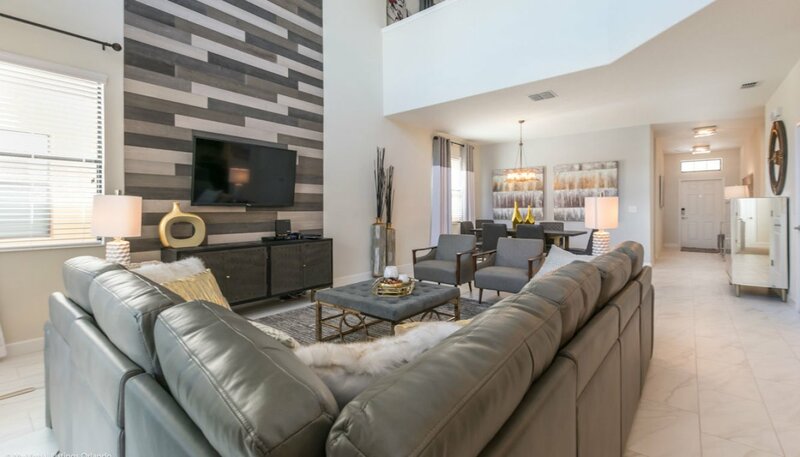 The hallway then leads onto the spacious open plan living space with family room, dining area and kitchen beyond. 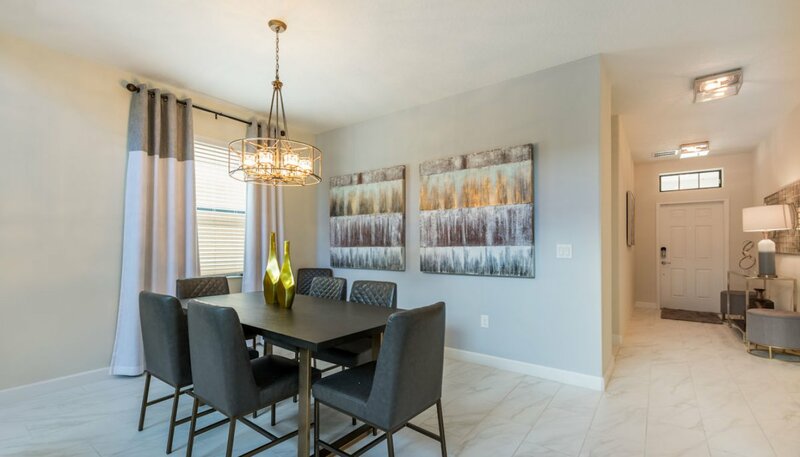 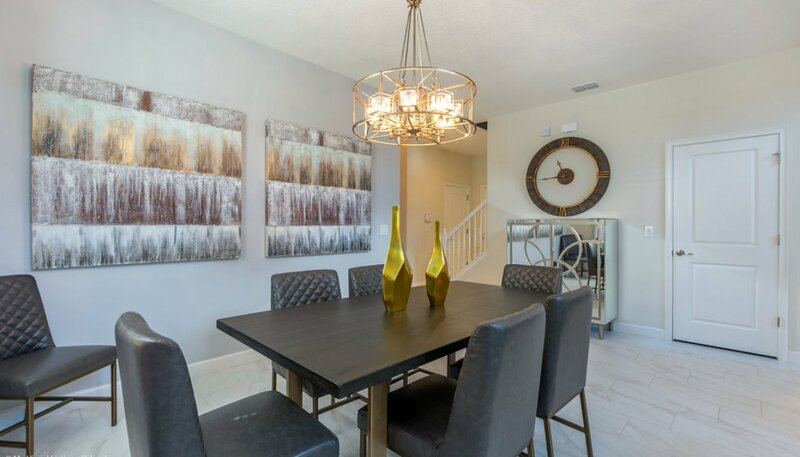 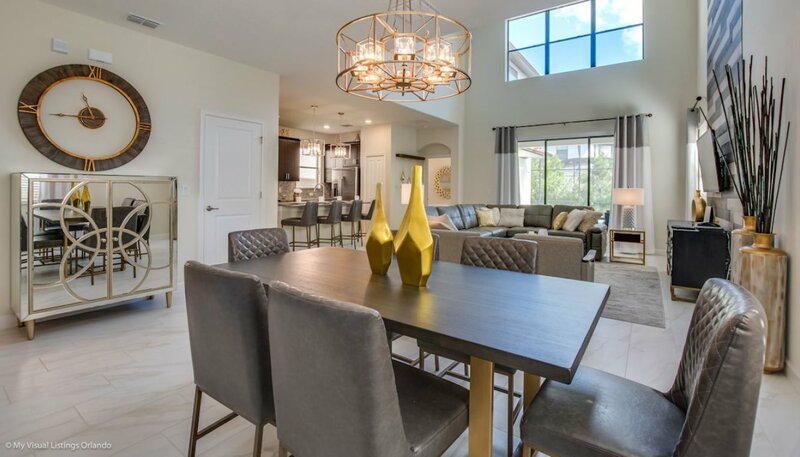 Adjacent to the family room in the corner is the beautifully decorated dining area with large dining table with 6 chairs and is ideal for large parties and formal dining. 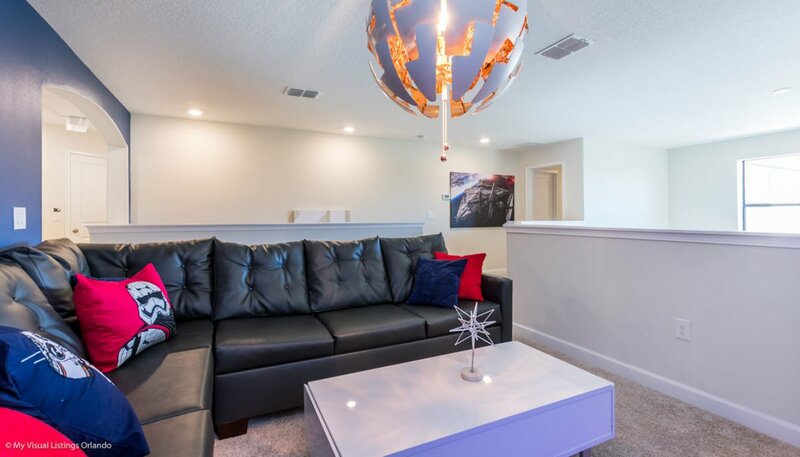 The comfortably furnished family room offers direct access & views to pool deck and ample seating for you to relax and enjoy the large wall mounted LCD cable TV with DVD player. 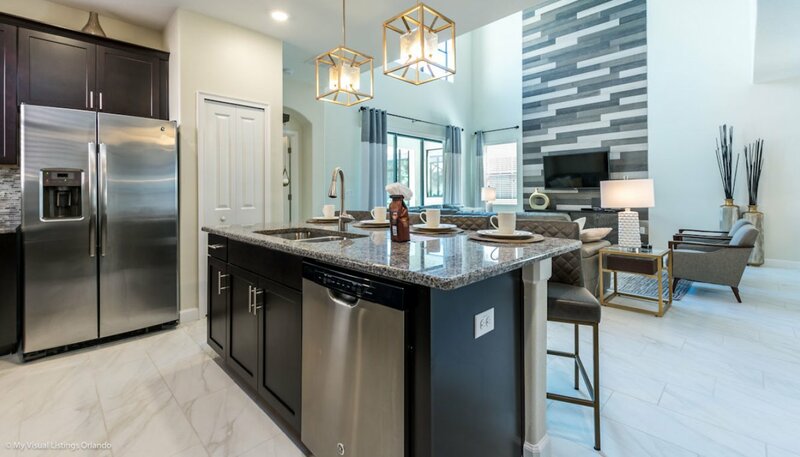 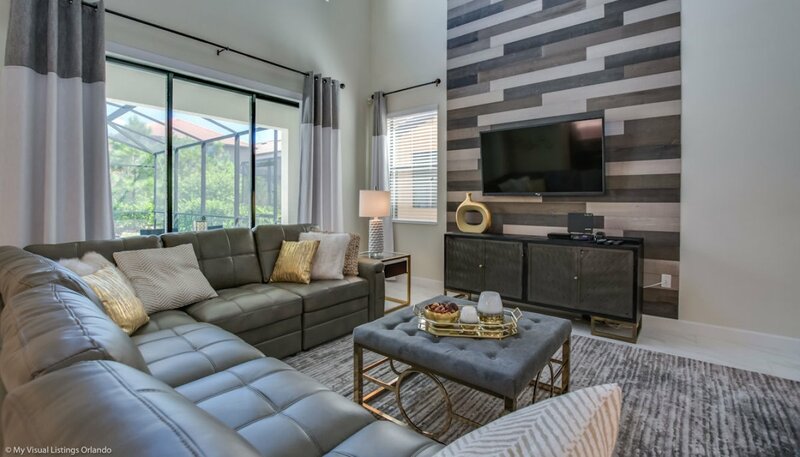 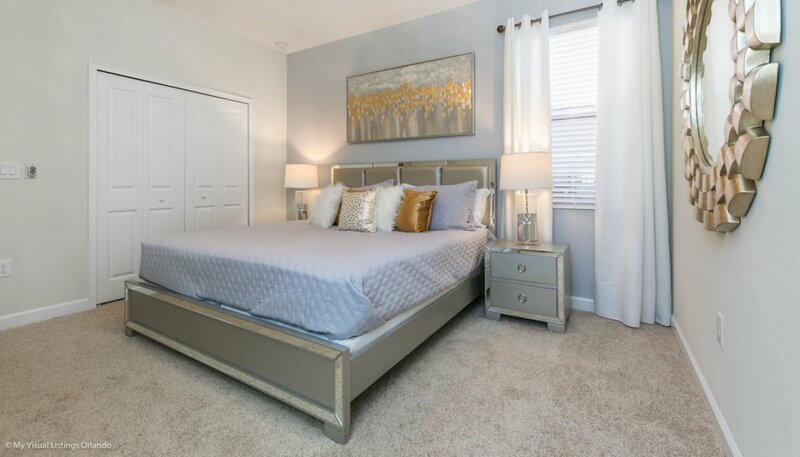 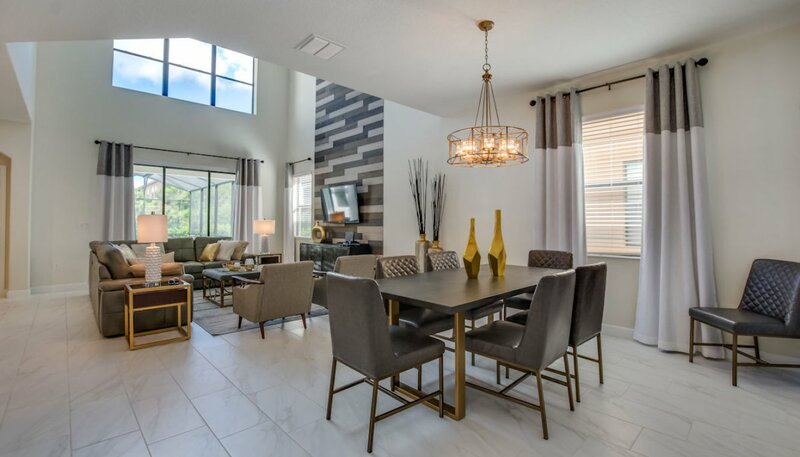 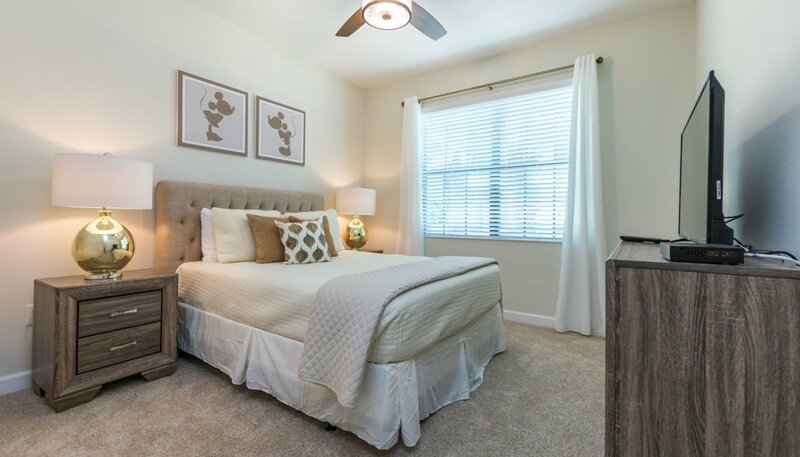 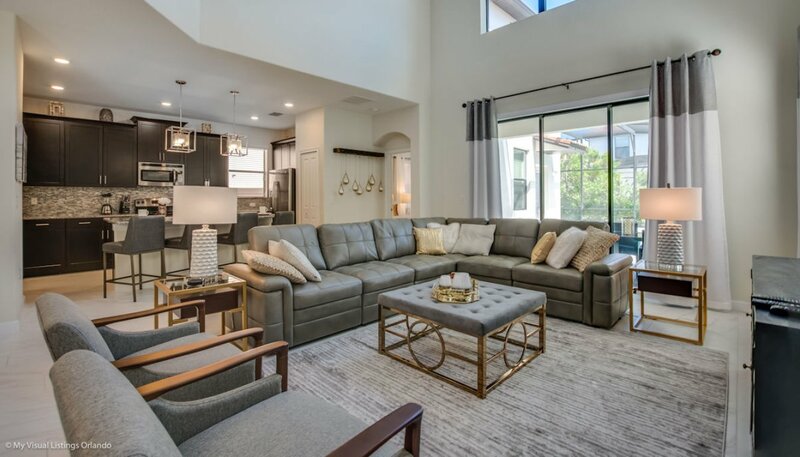 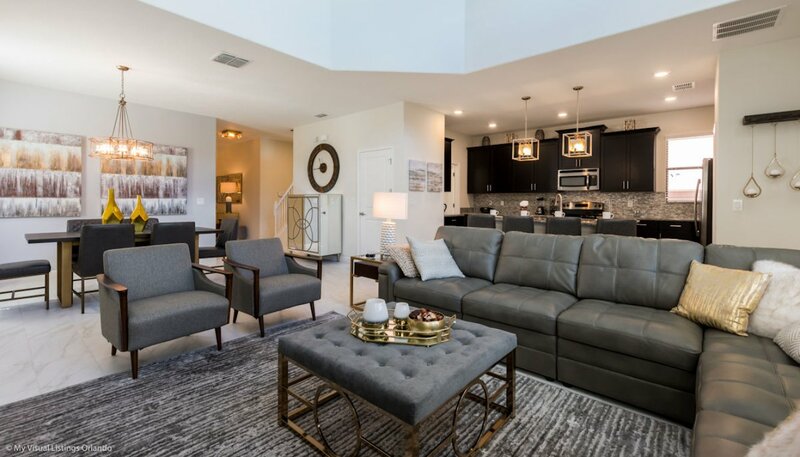 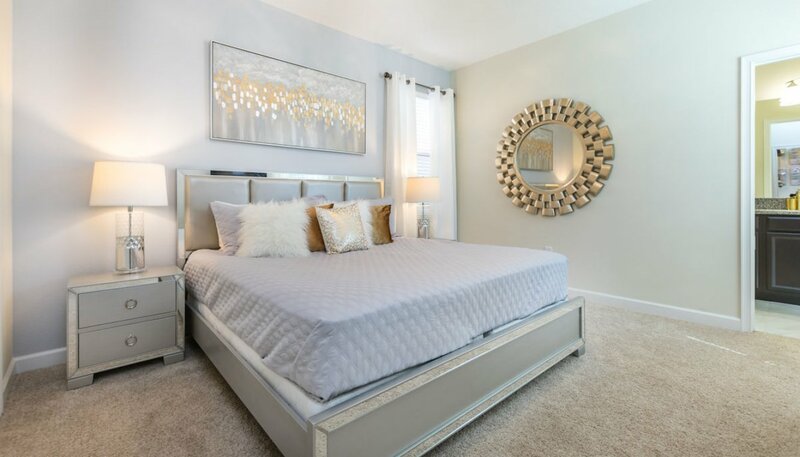 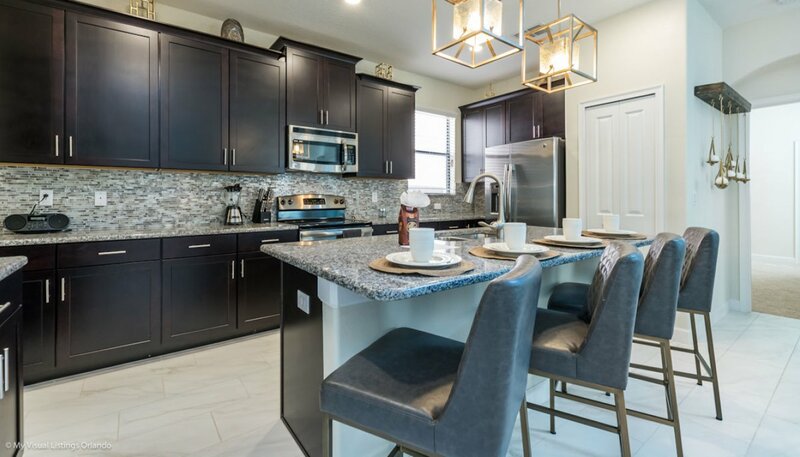 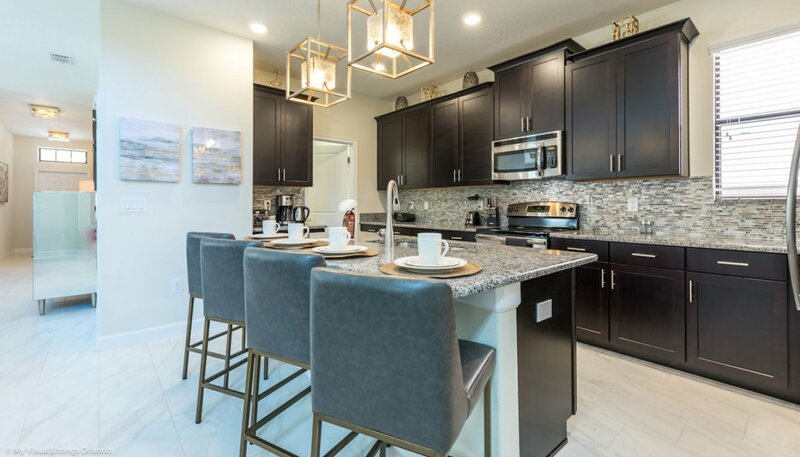 Luxury kitchen with granite countertops & stainless steel appliances has all the amenities including dishwasher, stove with oven, microwave, refrigerator & freezer with automatic water and ice dispenser, waste disposal, coffee maker, blender & kettle. 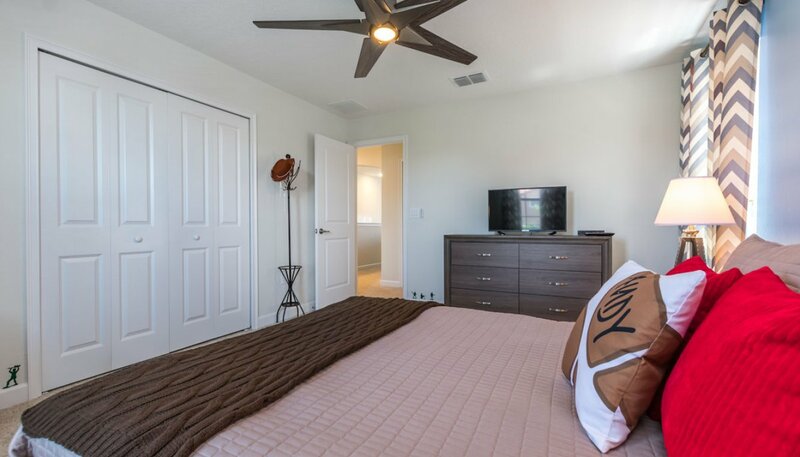 The large master bedroom with its wonderful views over the pool deck has been furnished with a king sized bed, matching nightstands, chest of drawers, large built-in wardrobe, LCD cable TV & ceiling fan. 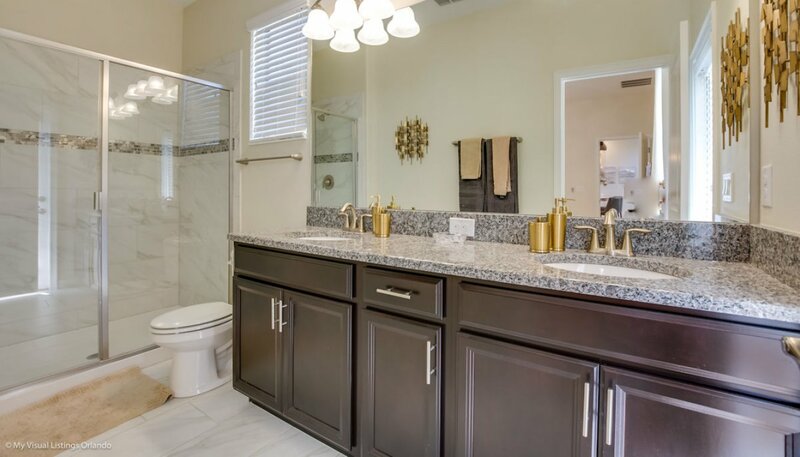 The connecting spacious ensuite bathroom has a large walk-in double shower, his & hers sinks and WC. 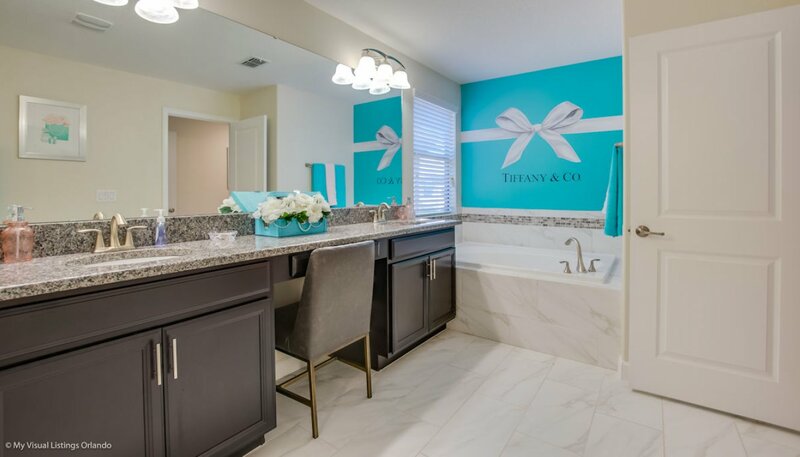 This bathroom also serves as the pool bathroom. 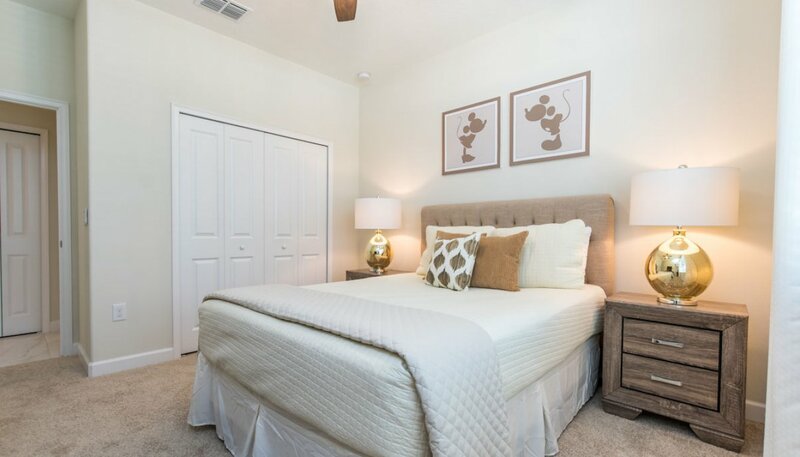 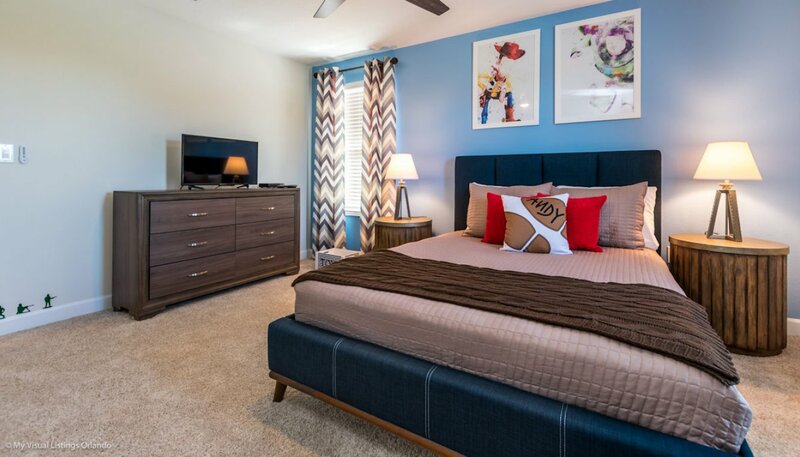 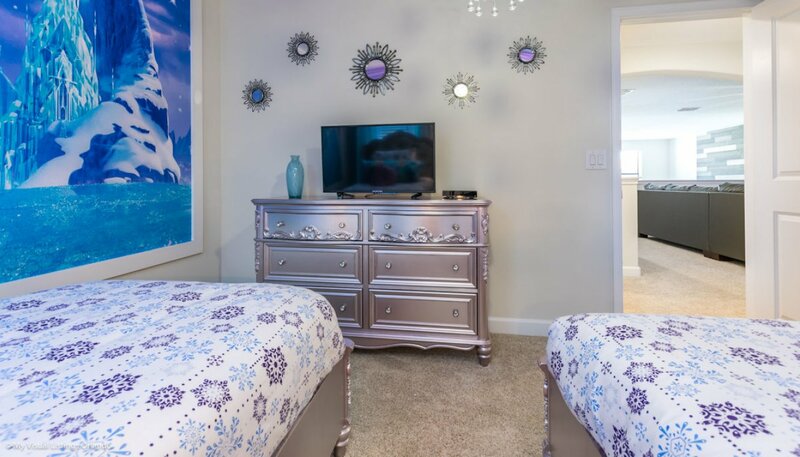 This Mickey & Minnie themed bedroom features a queen sized bed with matching nightstands, chest of drawers with large LCD cable TV above, large built-in wardrobe & ceiling fan. 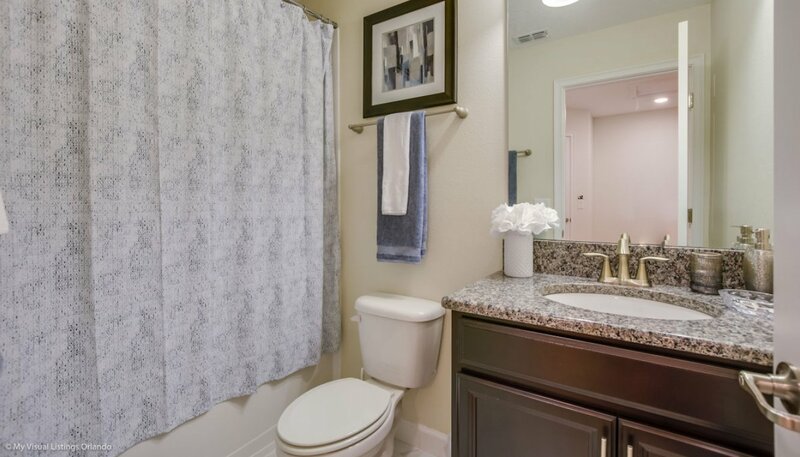 This ground floor family bathroom is adjacent to bedroom 5 and also serves the ground floor living space. 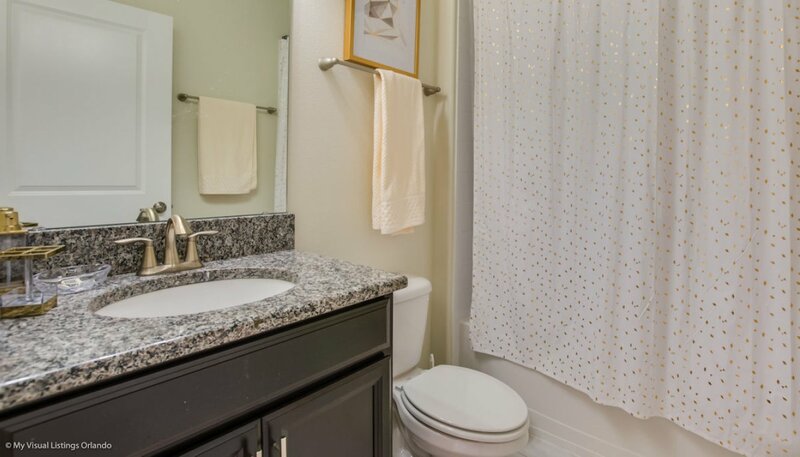 There is a bath with shower over, WC and built-in sink unit. 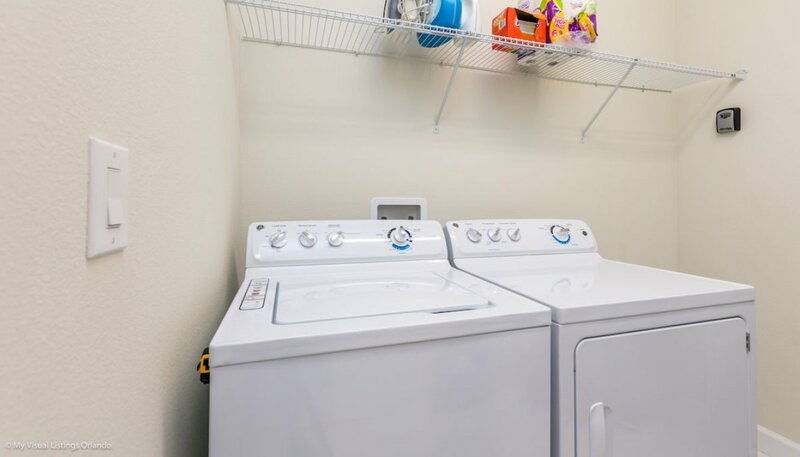 The laundry room provides a full size washing machine & tumble dryer for your convenience - enabling you to keep your luggage light so there is plenty of room for all those bargain designer clothes from the excellent local outlet malls. 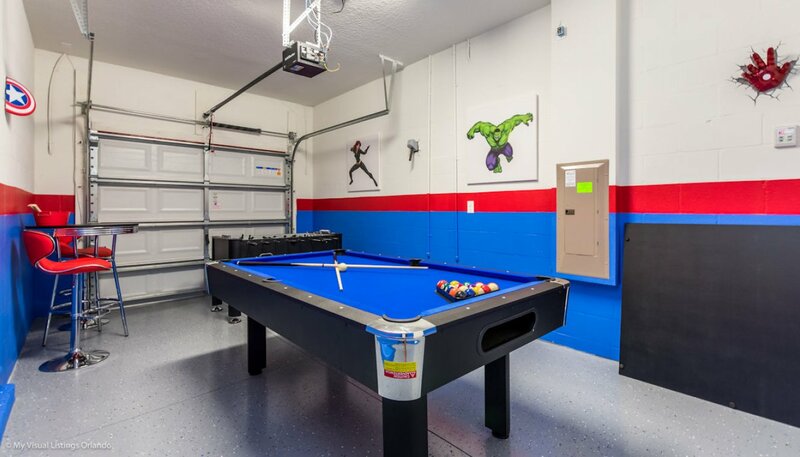 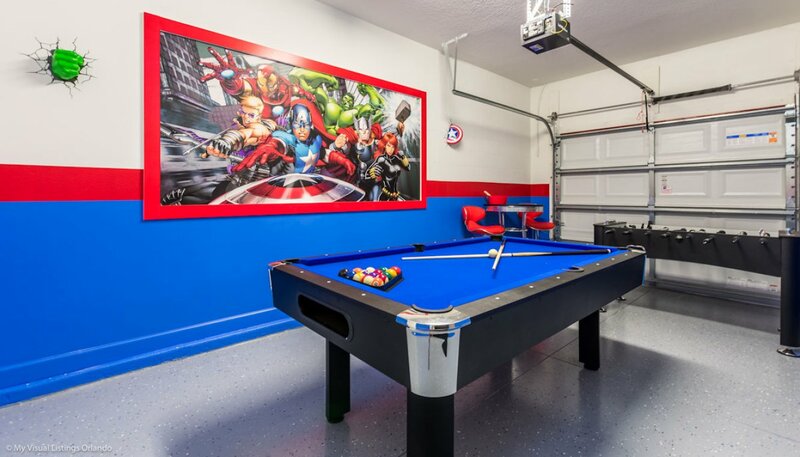 The garage has been converted into a Marvel themed games room which is equipped with table foosball, a pool table & 2 bar stools & table. 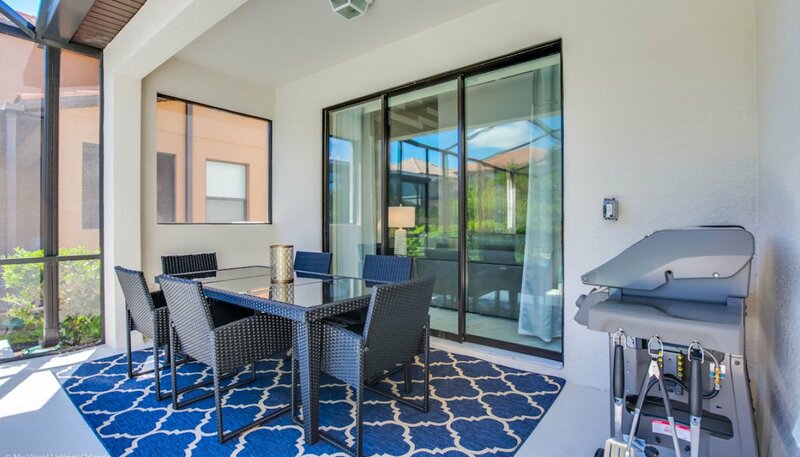 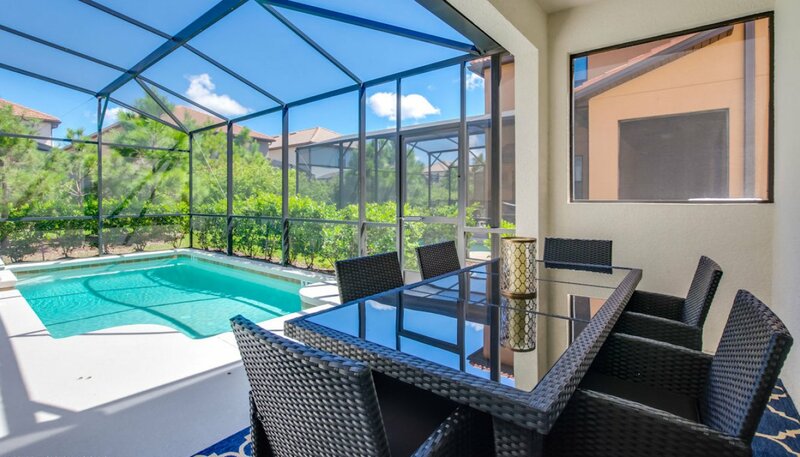 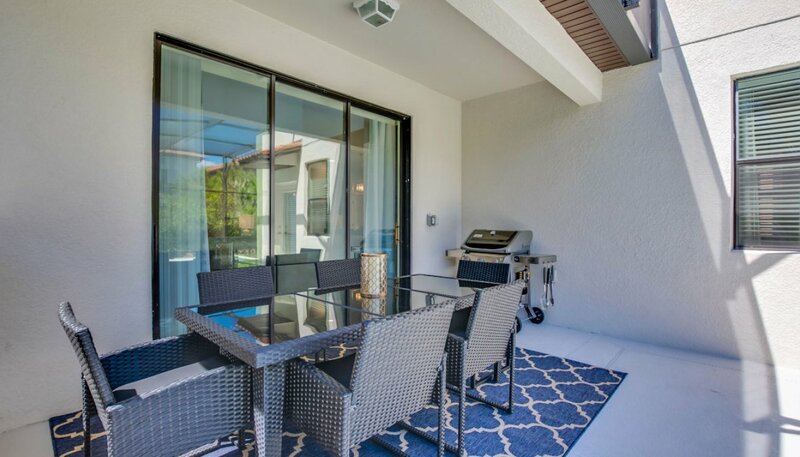 The pool deck has a large north facing pool and rattan pool furniture including a dining table with 6 chairs under the shady covered lanai. 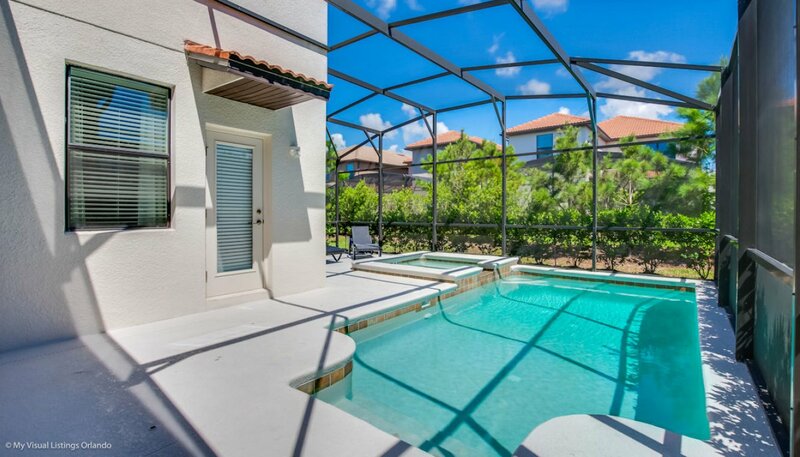 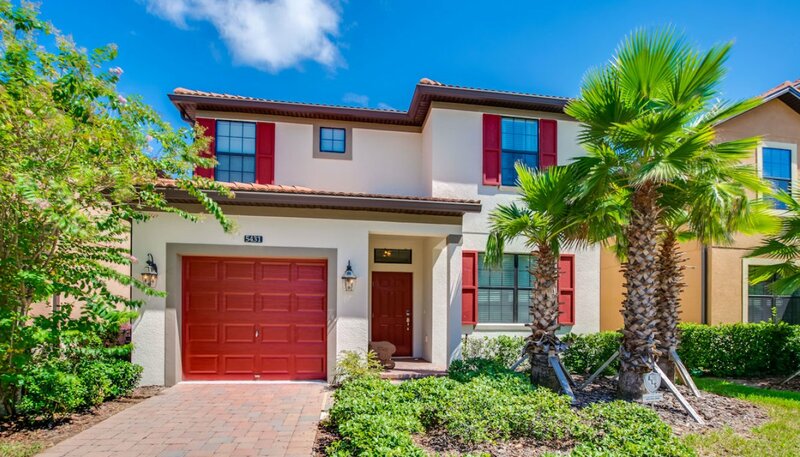 Approximately a 3 minute walk to the excellent resort clubhouse and community pool. 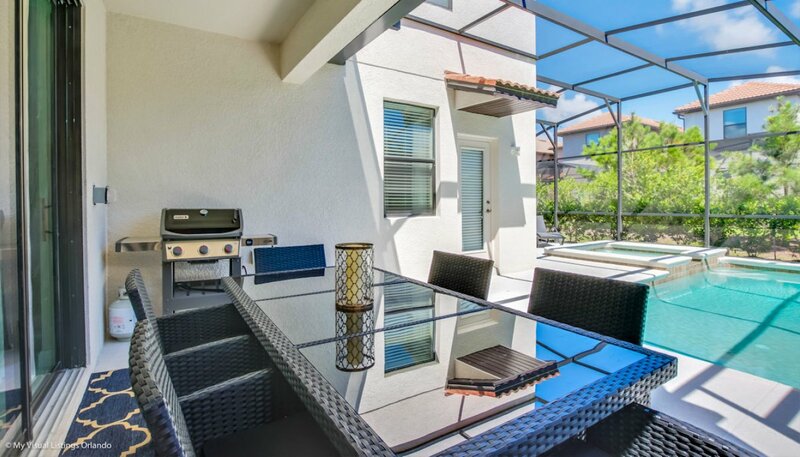 Posner Park with a selection of shops and IMAX cinema is just a 6-minute drive away. 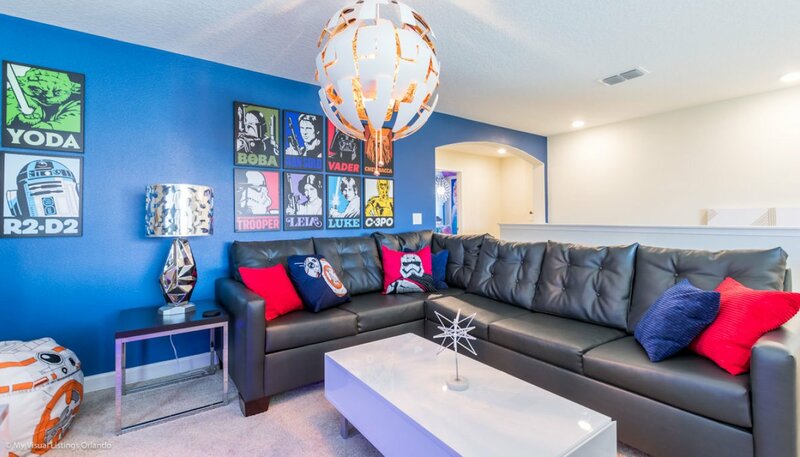 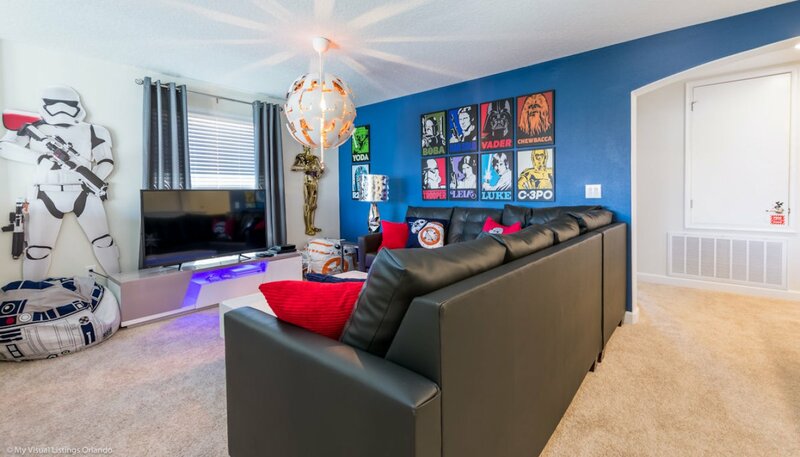 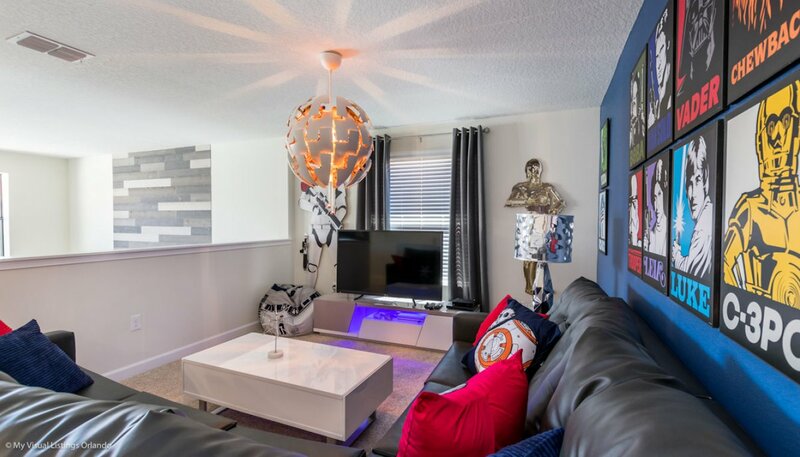 The Star Wars themed entertainment loft located at the top of the stairs has wrap around sofa seating for 5 people. 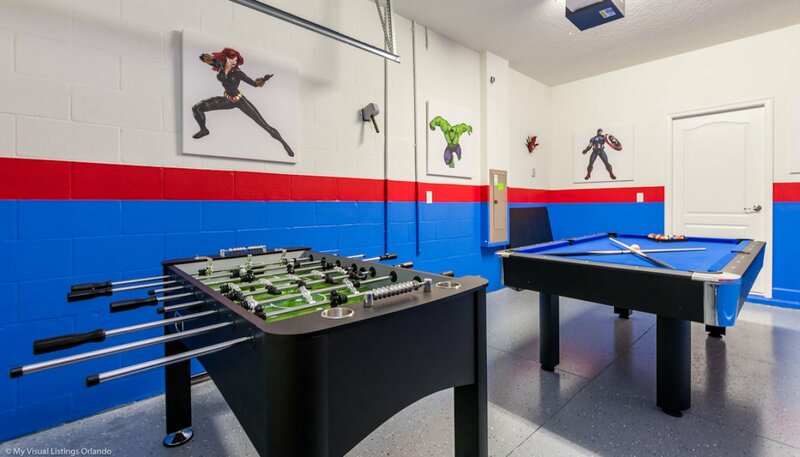 The room has a large LCD cable TV & PS4 - an ideal place to enjoy gaming or a movie away from the action downstairs. 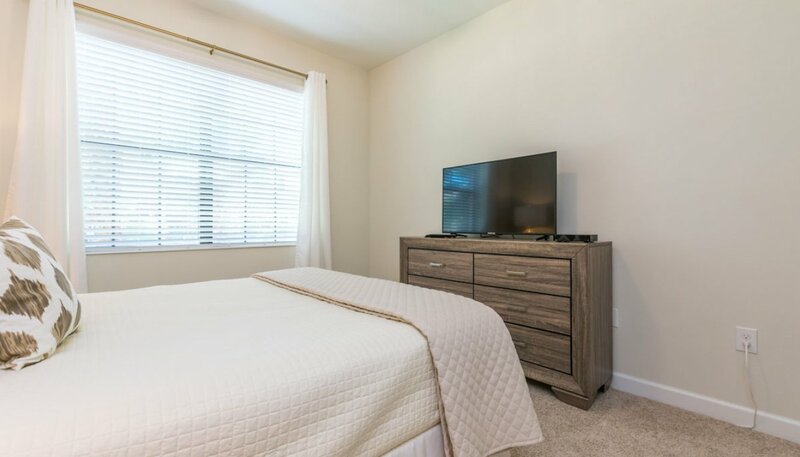 The large master bedroom with its wonderful views over the pool deck has been furnished with a king-sized bed, matching nightstands, chest of drawers with large LCD cable TV above, large walk-in wardrobe, & ceiling fan. 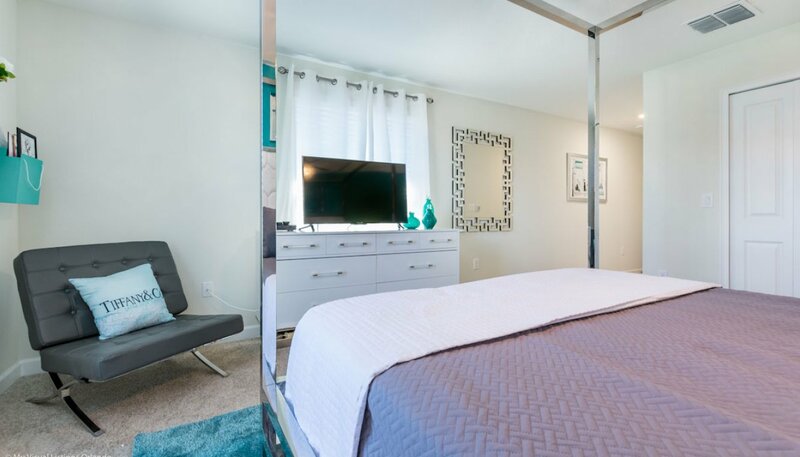 The room also has a corner seat & large mirror. 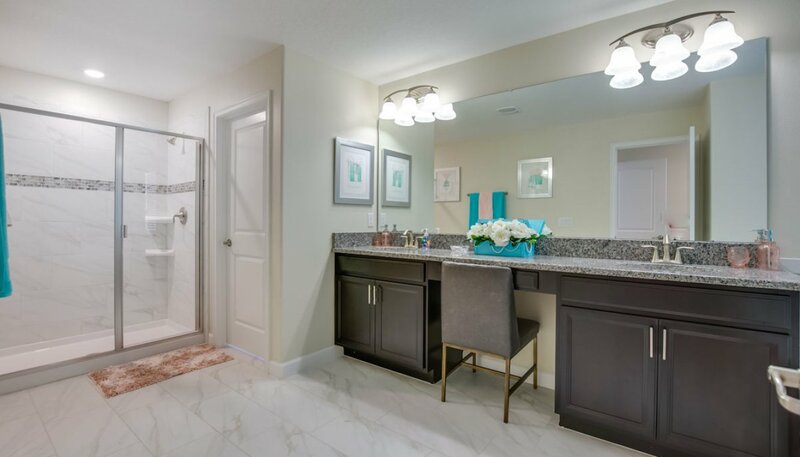 The connecting spacious ensuite bathroom has a large spa bath, walk-in double shower, his & hers vanity sinks with seat & a separate WC. 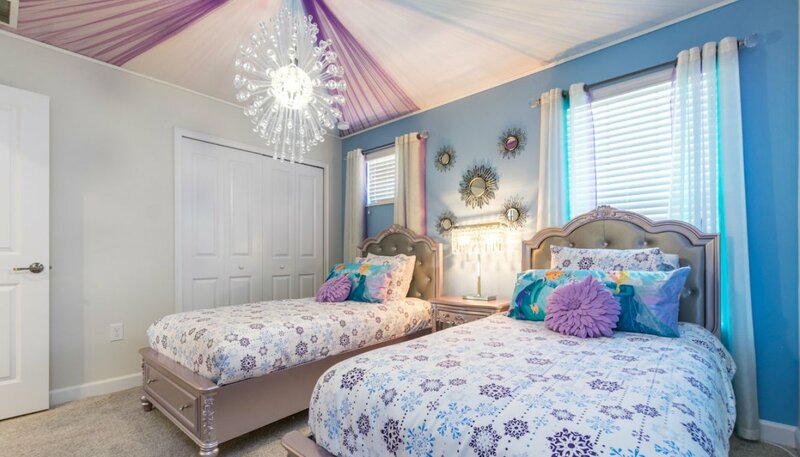 Bedrooms 3 & 4 are served by this adjacent family bathroom. 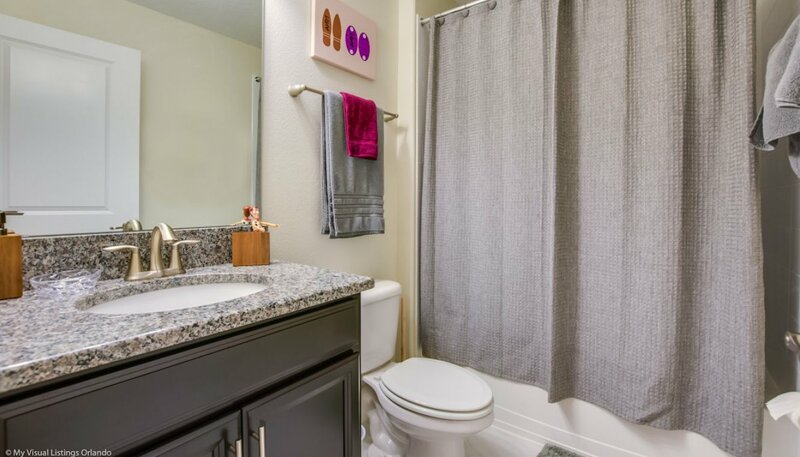 There is a bath with shower over, WC and built-in sink unit. 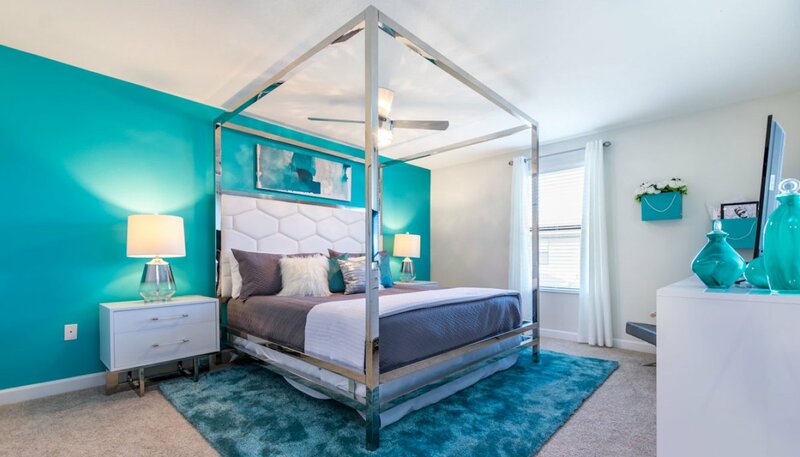 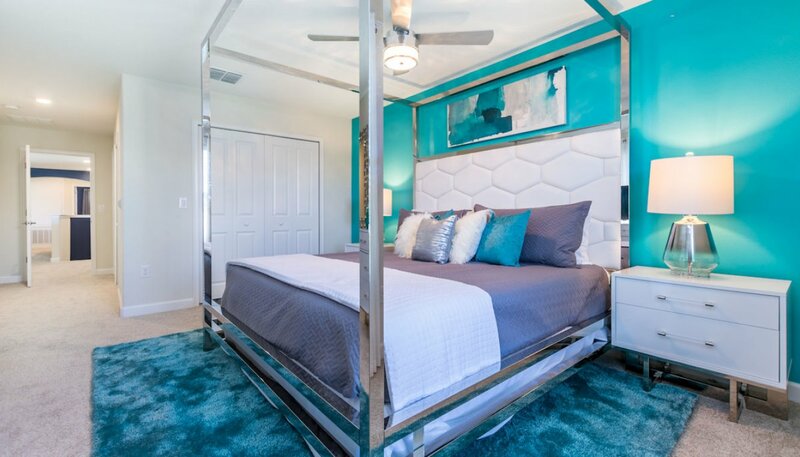 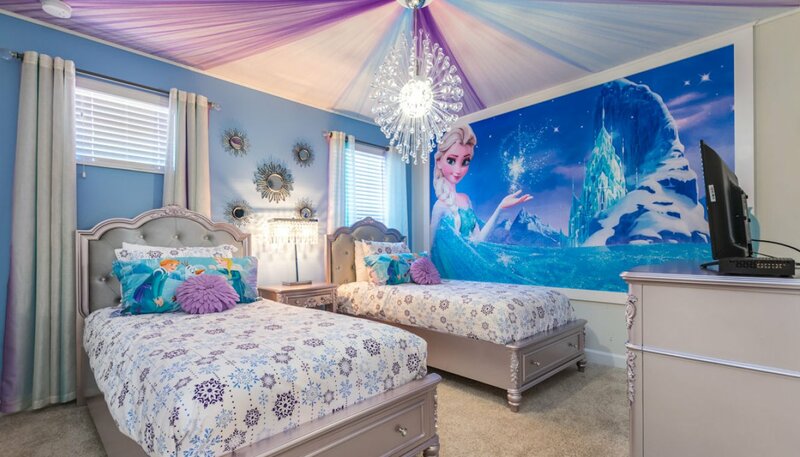 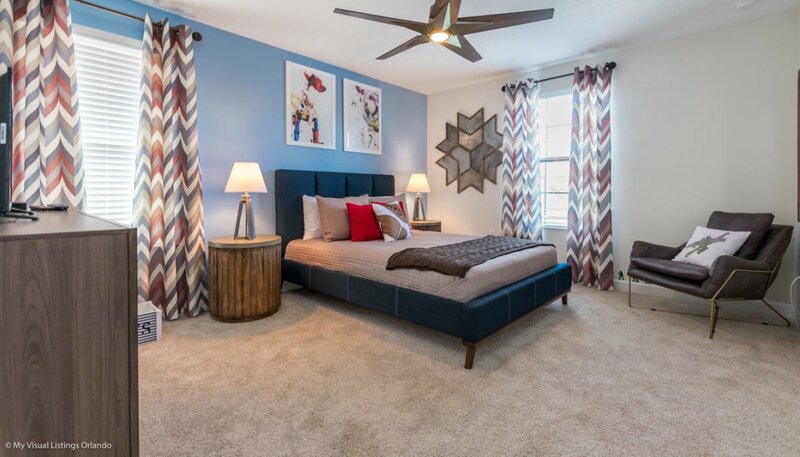 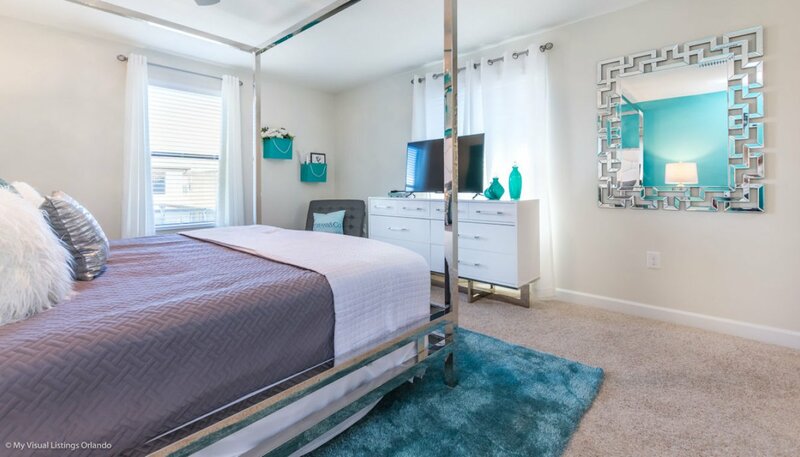 This Frozen themed bedroom comes equipped with twin beds with a shared nightstand, large built-in wardrobe, ceiling fan & chest of drawers with LCD cable TV above. 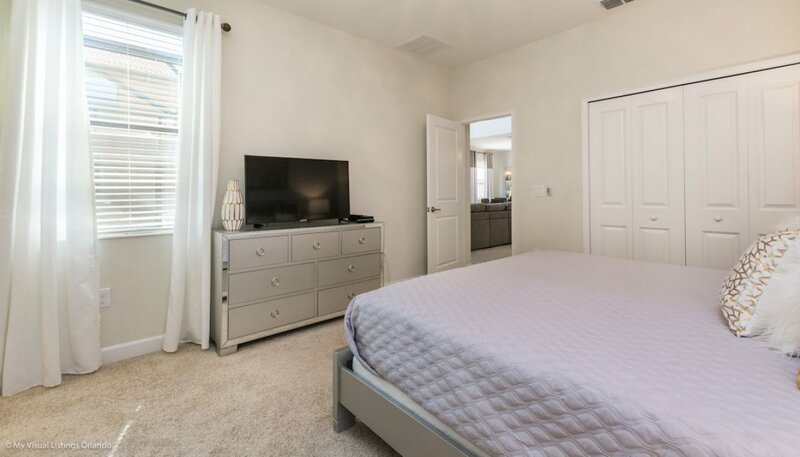 Opposite bedroom 5 and serving the loft area is the remaining family bathroom which comes equipped with a bath with shower over, WC and built-in sink unit.